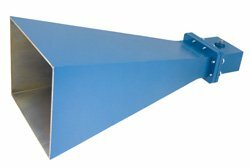 PE9862/SF-15 standard gain horn antenna (also known as a waveguide horn antenna) is part of our huge selection of waveguide antennas. Pasternack standard gain horn antenna is manufactured with a WR-229 input and a waveguide to coaxial transition adapter. Our WR-229 standard gain horn antenna has a waveguide to coax adapter transition with a SMA connector input that is female gender. WR-229 standard gain horn waveguide antenna with SMA input has a minimum frequency of 3.3 GHz and a maximum frequency of 4.9 GHz. Pasternack PE9862/SF-15 WR-229 waveguide horn standard gain antenna is rated at a nominal 15 dB gain. Our 15 dB standard gain horn WR-229 waveguide antenna with SMA adapter has a vertical beam width of 32.4 and horizontal of 32.7 degrees at 3 dB. Pasternack is where to buy a WR-229 standard waveguide gain horn antenna with WR-229 input. This gain horn antenna is just one part of over 40,000 RF, microwave and millimeter wave guide components available and in-stock at our Irvine, CA United States warehouse. Our WR-229 standard waveguide horn antenna with SMA female interface can ship worldwide the same day that it is purchased as with our other available RF parts.